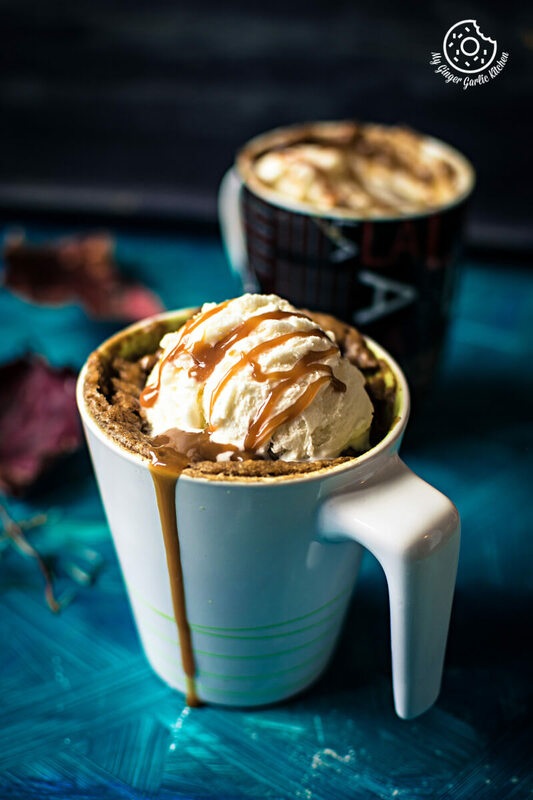 This Eggless Apple Pie Mug Cake is full of FALL-tastic flavors, giving you a rich, hearty, and warming feeling in this cold season. Pin it to your SNACK BOARD to SAVE IT for later! Follow My Ginger Garlic Kitchen on Pinterest for even more great ideas and deliciously appealing recipes! Hope you all had a great weekend. We celebrated our wedding anniversary this weekend. So this was a time for celebration for us. It was the time to cherish our 9 years of official and 18 years of unofficial togetherness. Yeah! It’s been a loooong time and it deserved a loooong celebration. The weekend was so full of fun activities and so full of deliciousness as good food. Cheers to that! 🙂 I also made some nice brownies, and I will share the recipe soon. Let’s talk about the recipe I am sharing today. 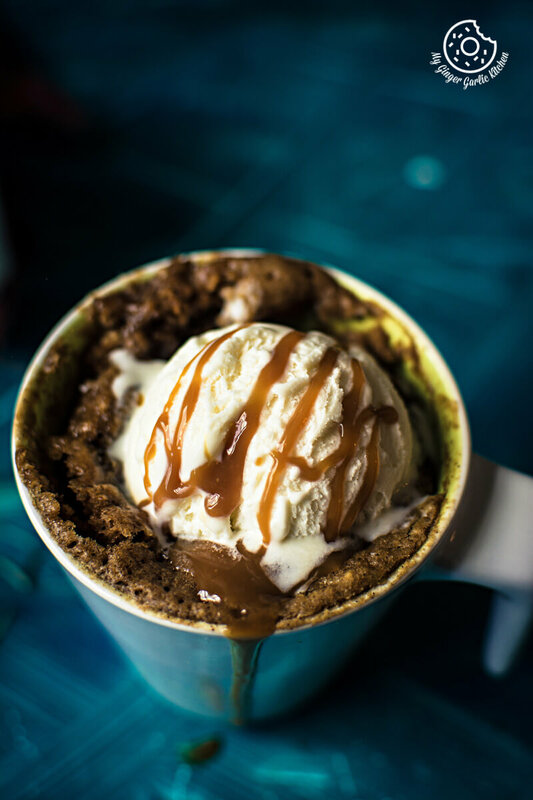 I haven’t shared many mug cakes on the blog, but this one was something I really wanted to share for a long time. 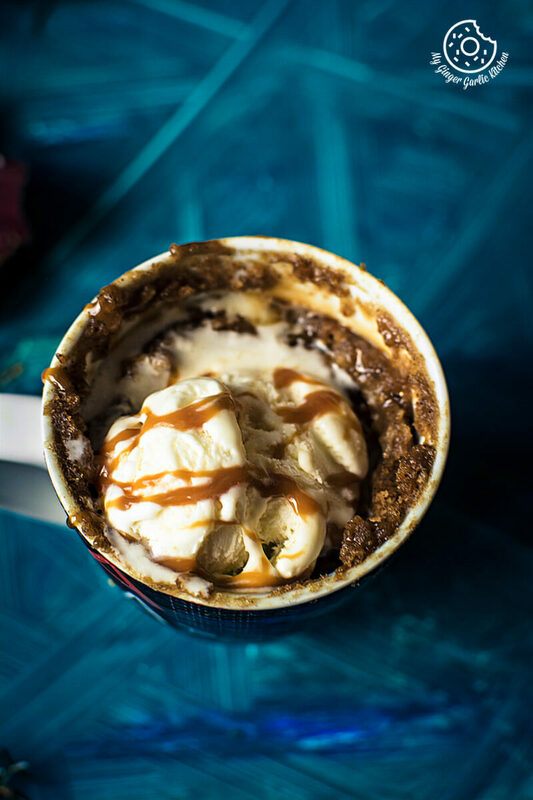 This mug cake is full of FALL-tastic flavors, giving you a rich, hearty, and warming feeling in this cold season. Fall is over here but stores are still so full of fresh apples. Apple season calls for apple pie filling recipes, isn’t it? Today again, this is a mug cake day because I have some more apple pie filling and I want to finish that up quickly. And what else could I think of, other than an easy peasy fuss-free cake? The reason number 1 is that mug cakes are not a huge fuss, you only need a few ingredients and you will be eating cake in no time. 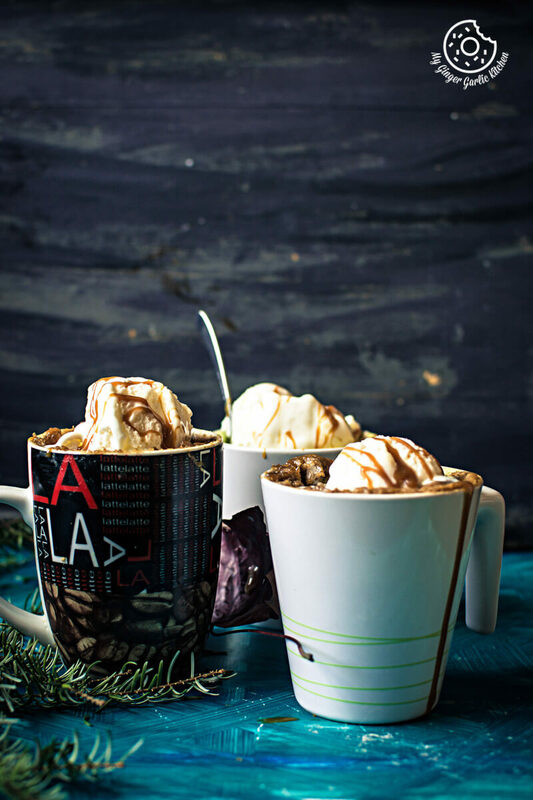 We all know that they are the easiest desserts to satisfy our sweet cravings. Microwaved cakes are the best. I love those late night hours when my sweet tooth takes over and I want something as a quick solution. The mug cakes come to the rescue at such times. 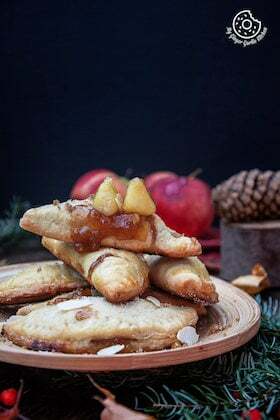 At this time, you may ask, “Does it have the same texture as a baked apple pie cake?” Yes, they are the same as a baked cake, the only difference is that you get to enjoy them in lesser time and there’s little washing up! Yeah!!!! And I particularly love mug cakes because I hate washing dishes. Hey, have I told you that my dishwasher broke down a couple of weeks ago? So now the cooking and cleaning times have almost doubled. Alright here’s the interesting story. So I called to the service center and they sent a guy last week. He checked it out, and found that there were some defunct electrical parts. Unfortunately, he couldn’t fix it on that day because he had to get those new parts from his office. So he left. And then, we had to book a new appointment again. And then they said they have a long queue and so after some urgency requests, we got our next appointment date which is tomorrow. It’s taken more than it should have. WAITTT, long queues? Does that mean that there’s been some alien strikes on all the dishwashers in town????? You bad-bad aliens! Alright, so then dishwasher will be safe, and aliens will be all gone. It means that it would be about time for celebration for all earthlings. 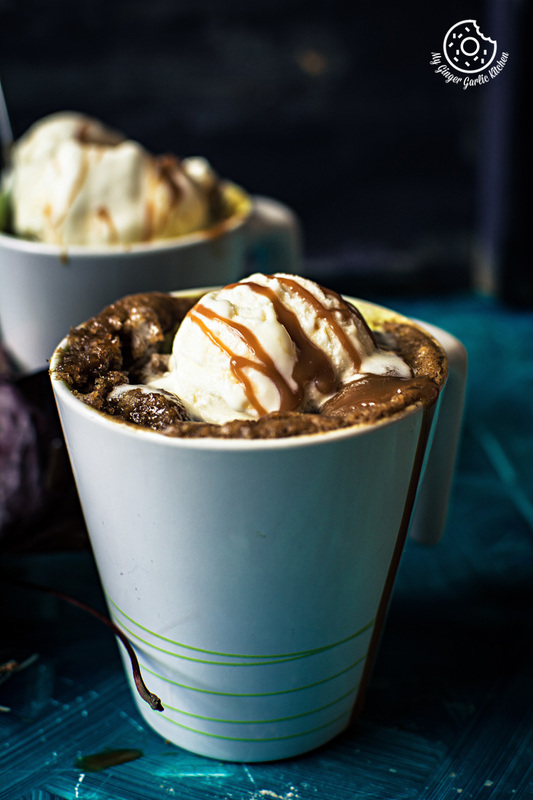 So let’s make this mug cake now. 1. 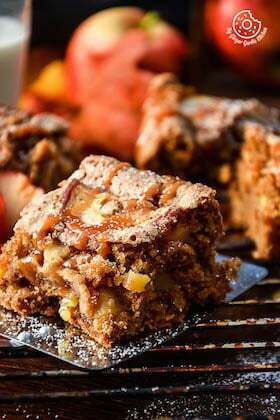 In a small bowl, combine wheat flour, 4 tbsp sugar, oil, cinnamon, salt, baking powder, vanilla, vinegar, milk. 2. Whisk everything together until combined and no lumps remain. 3. 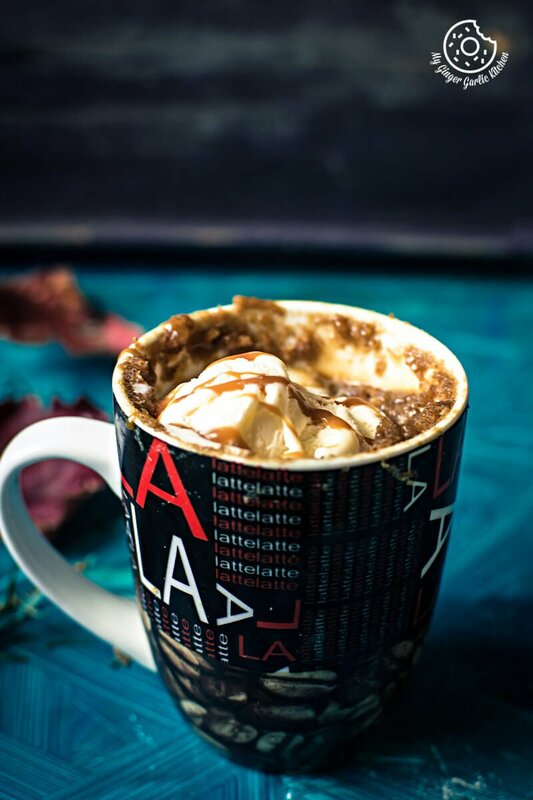 Pour 3 tbsp batter into a microwave-safe mug. 4. Add 2-3 tablespoon apple pie filling. 7. Repeat with the second mug. 8. Carefully remove the mug from the microwave. 9. 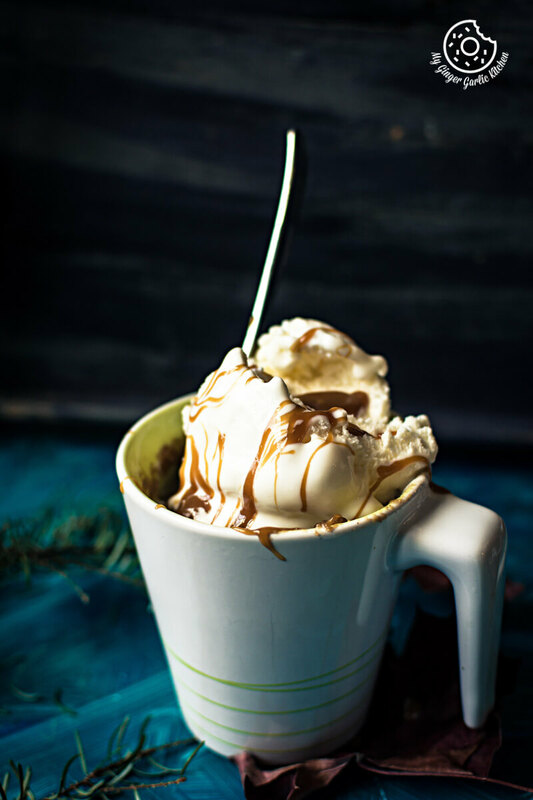 Top with a dollop of ice-cream and drizzle with salted caramel sauce on top and enjoy!